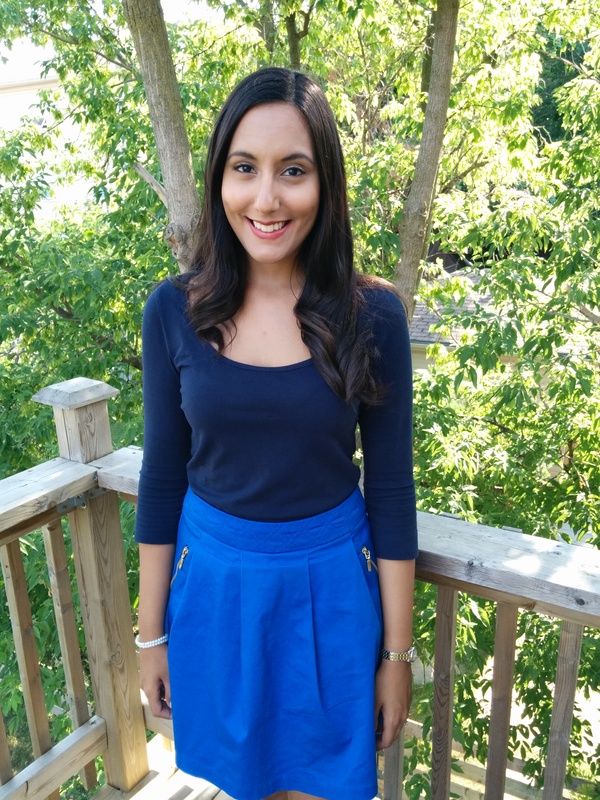 My name’s Vinita Marwaha Madill and I’m an advocate for women in STEM. I’m currently based at the European Space Agency (ESA) (via TERMA B.V.) working on future human spaceflight projects as a Space Operations Engineer. I’ve also been involved in spacesuit design for the European Space Agency (ESA) along with working as an Operations Engineer for the International Space Station at the German Aerospace Centre (DLR). Being based at Germany’s version of “Mission Control”, I guided astronauts through experiments on the ISS and was involved in astronaut training. I’m passionate about human spaceflight and exploration. 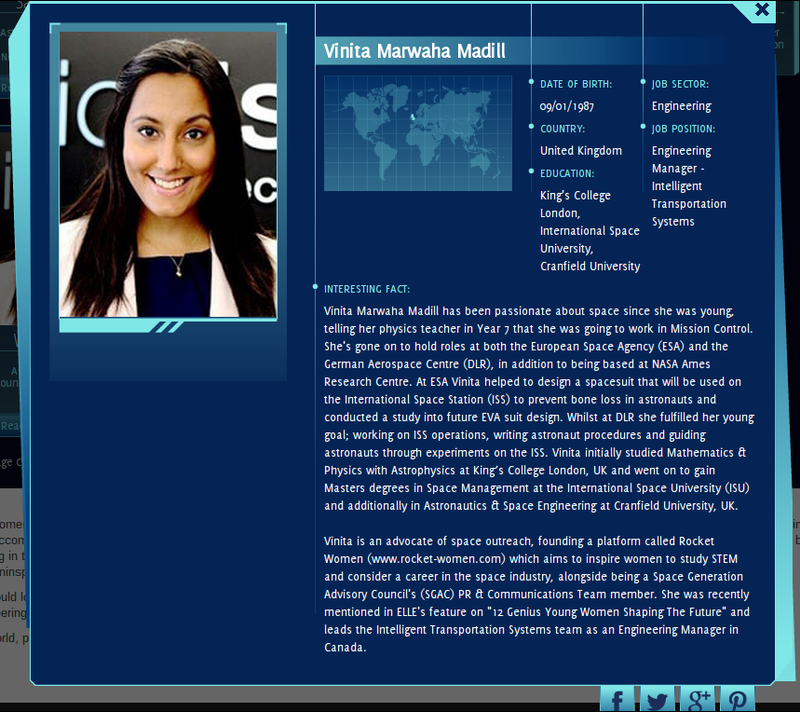 My mission is to inspire women around the world and provide advice on working in the space and technology industries. Over my career I’ve worked with and gained advice from amazing women and I wanted to share this with everyone. giving these women a voice & platform. I’m interviewing successful women from the space industry, technology, aerospace and science research. 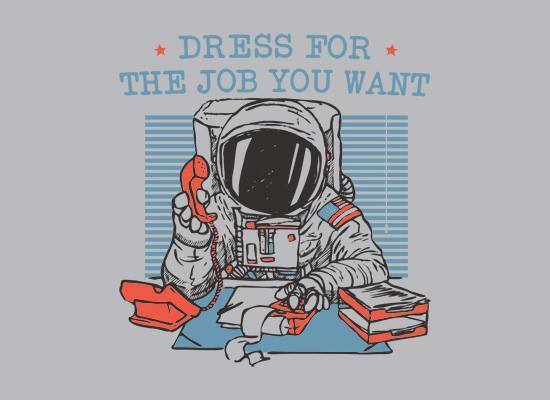 This includes astronauts, government policy makers, commercial spaceflight employees and engineers. Articles and videos from these interviews will be posted on the site to hopefully inspire you and show that you can be a rocket scientist too! I’ll also be posting interesting news and advice on working in the space and tech industries, including current events. STEM Educational Outreach, Diversity & Women In STEM public speaker. On-camera & live radio experience. Freelance Writer – Topics including Women In STEM & Human Spaceflight Exploration. American Scientist Author – ‘A Spacesuit That Squeezes‘ named #1 Most Popular Article of 2015. Spacesuit (EVA suit) Design, Crew/Astronaut Training and Human Spaceflight Operations expert. Clients include the European Space Agency (ESA) & Wyle GmbH..
Technical Writing and Procedure Development. Experience with crew/astronaut procedure development. Project & Program Management. Over 8 years of Project & Program Management experience, through roles including Line of Business Owner & Engineering Manager, successfully managing a team of 10 engineers & a $2.2 M budget. My name is Aliya Janjua and I started a podcast series called “Confessions of Successful Asian Women”. In my podcast, I interview women from various backgrounds and have them share their stories in how they got to be where there are today. My mission is to build a community of women who connect, share and inspire one another to reach their dreams. The podcast is on iTunes and my website is http://www.confessionsofsuccessfulasianwomen.com. I am a huge supporter of women in STEM and I am actively involved as a mentor with TechWomen, which is an initiative that was started by the US Department of State’s Bureau of Educational and Cultural Affairs. TechWomen’s mission is to empower, connect and support the next generation of women leaders in STEM from the Middle East, Africa and Central Asia through mentorship and exchange. I would love the opportunity to interview you and share your story. I am based in San Francisco and we can do the interview over GotoMeeting. I will send you the questions prior to the interview. The interview should be 45 minutes. Prior to the interview, I would love to have a pre-interview call so that I can learn more about you. I will work around your schedule. I hope we can connect! I am really looking forward to it!